"We partnered with the HR Learning Center and Melissa Fleischer earlier this year to deliver live anti-harassment sessions for all employees. It was an absolute pleasure working with Melissa and her knowledge on the topic provided management with a comfort level needed for this type of training. She worked with us to develop training that was related to our specific industry and was interactive keeping attendees engaged. All who attended left the sessions with a clearer understanding of the topic and how it related to everyday life. I look forward to partnering with Melissa and the HR Learning Center in the future." “Excellent! The trainer, Melissa Fleischer, really provided an open, constructive environment to help clarify our team's perception of specific employment laws and regulations. Personally, I thought it was one of the best training sessions I've been to in 15 years of management. The training kept everyone attentive and engaged." "From the moment we contacted HR Learning Center all the way through the delivery of our training, we had a great experience. We found them to be highly responsive, very professional, and most importantly eager to ensure we received what we wanted. The trainer was top caliber and not only did he review key points with us, but wove his personal legal experiences in throughout to help us gain some perspective and applicability. 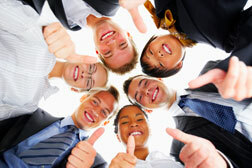 We would highly recommend this company for any of your HR training needs." "Your presentation was excellent. I wish we had more time because all the information you provided was very helpful and it came from an expert. You’re an excellent speaker and I find you to be very knowledgeable and helpful with the subject matter. " I just wanted to say thanks for the outstanding Workplace Violence Seminar you presented last week in Southbury, CT. My wife & I both agree the information was "spot on," and your instruction was interesting, entertaining and informative. It was very obvious both of you are passionate about the subject and have researched and collected the most applicable and useful facts. Your diverse backgrounds provided a "wide angled" and comprehensive view of the problem and potential resolutions, from legal/regulatory to strategic/policy to tactical/immediate actions. I think your program will have a direct effect in making all who attend more aware & empowered, and ultimately safer." "Melissa Fleischer is an engaging and knowledgeable trainer and expert in human resource law. 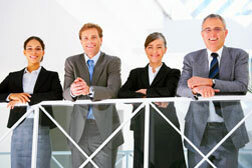 I would recommend her to any organization seeking to address human resource compliance issues. All of our partner organizations have given her excellent reviews and she would be an asset to any organization, be it non-profit, government, or for-profit." "Progenics had the opportunity to work with Melissa in providing Anti-harassment and Discrimination education for all our employees. The experience was very positive and well received by our employees. Melissa informed our employees of the legal definitions of Harassment and Discrimination and also blended the Company Core Values and Policies into that educational experience. The resulting training was excellent and informative." "The HR Learning Center provided Harassment Prevention Training that was engaging and informative. Melissa was able to provide 'real-life' examples by using HR Case Law participants were able to better understand the Anti-Harassment Laws after they listened to real cases with real consequences. 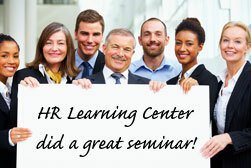 I would recommend The HR Learning Center to any organization needing training on HR Law." 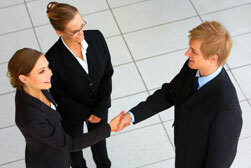 "Melissa Fleischer is the go to person in Human Resources Training and Employment law. She presented "Employee Handbooks: Do's and Don'ts" to our Gold and Platinum members, and completely blew us all away with the great information she revealed. Her knowledge and advice is a must for the business owner. I wholeheartedly recommend Ms. Fleischer." "Melissa Fleischer, of HR Learning Center, provided an extremely detailed and easy to understand webinar on Legal Landmines of Exempt vs. Non-Exempt Classification Issues. I would not only take another course with Melissa and HR Learning Center, but I would also recommend it to others." "Great presentation, It was definitely good information and the listener has a real sense that the trainer, Melissa Fleischer, was trying to help them. Good use of everyday examples. Melissa Fleischer should definitely walk away each day knowing she has made a positive difference for others."